Computer update: Please excuse the pathetic lack of blog posts for the last week or so. As you all know my computer died and it's been awful figuring out the problem. After days of waiting, the Geek Squad finally came over and declared that I needed a new computer. Nightmare. After days of considering all our options my genius sister recommended simply buying a new hard drive. Duh. We did for $75 and now we're on our way. After nap we gave him his basket. No Easter bunny. No egg hunt even. It was wonderful concentrating on the wonderful message that we heard at church. He wasn't all that interested in the one little gift or the shredded paper or anything else. 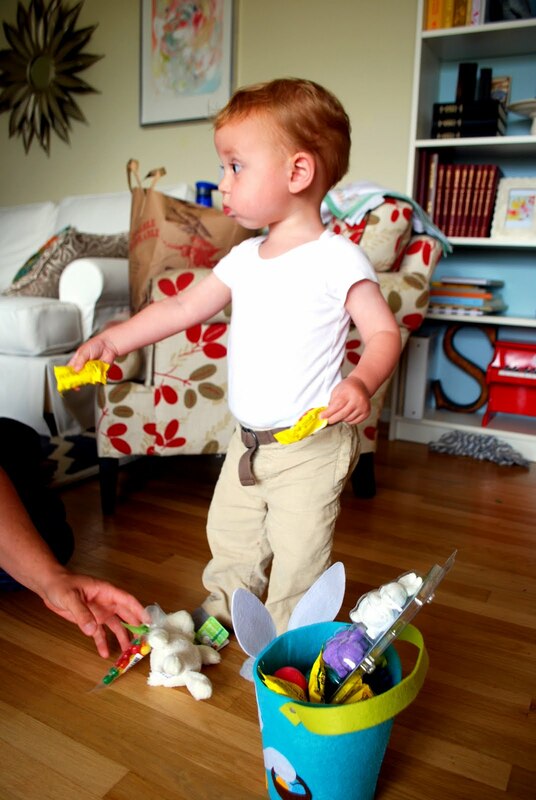 No, he must be my son because all he cared about in his basket was the Reese's peanut butter eggs. 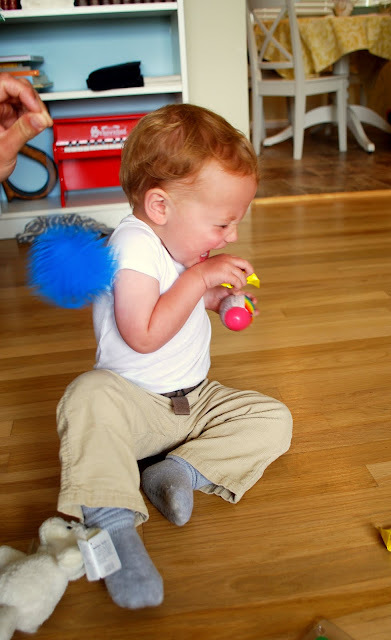 Though he did find it hilarious when David tickled him with his blue "finger" thing. What are those things called anyway? Then I made my very first Easter ham with a delicious mustard, honey, citrus glaze. An eight pound ham for 2 1/2 people is a lot of ham so we ate the leftovers for days. I never liked ham growing up but I made it very well, I must say! Scalloped potatoes, lemon brussels sprouts and homemade rolls. I had planned to make strawberry shortcake for dessert but we were pretty overstuffed so we skipped that. Easter is a lovely holiday. Spring is the perfect time to celebrate the resurrection of Jesus Christ. I think we were somewhat disenchanted with the commercialness of Easter this year and it was more wonderful than all the silliness that comes with elaborate egg (or I even heard a ridiculous anti-religious group demand we call them "spears") dyeing, baskets full of gifts or a random bunny tradition who leaves eggs. That doesn't even make sense to me. I hope you all had a wonderful weekend as well. That boy knows his candy! Reeses eggs are my all-time favorite! 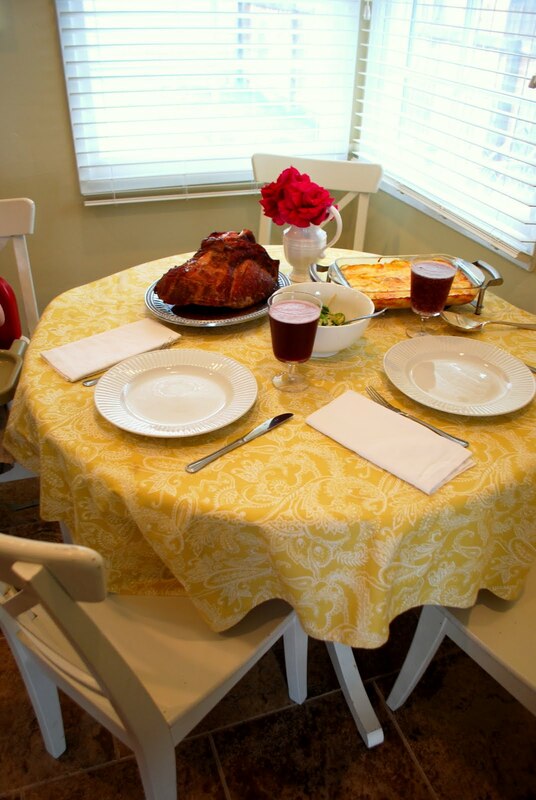 LOVE that tablecloth! 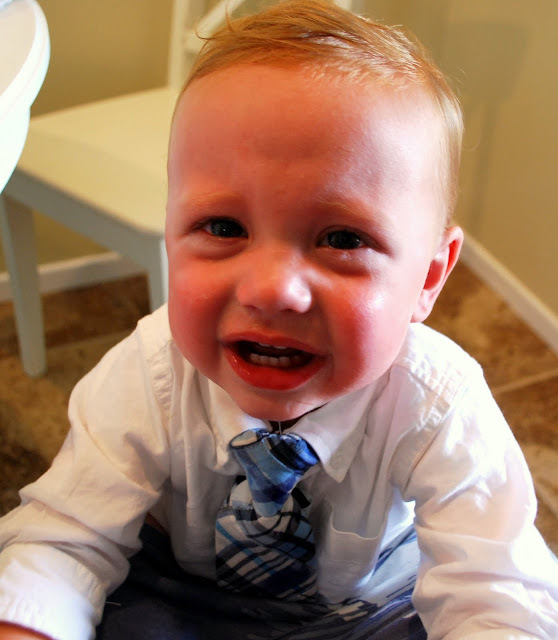 and your baby is SO cute!! !